The market is flooded with so many fitness band brands. But there are very few which stands out from the rest of the lot. Some of them are as follows – Following list is not in any particular order. This is a list of brands having one or more best selling / quality fitness band under their name. Garmin is an american company producing products related to gps in automotive, sports and fitness, marine, aviation etc. Vivosmart, vivofit, vivoactive , vivomove etc are their different fitness band product categories. It is available in different price ranges starting from INR 5099 to 19,999 and more. These bands have got different features like smart notification, vibration alerts and auto sync. Offers are available in both their official website, amazon offers, and flipkart offers. MI products are manufactured by Chinese Electronics Company by the name of Xiaomi. They have wide range of products in the electronics and software segment. MI fitness bands are perfect for those who are into fitness. You can track your fitness level on daily basis. They have various features like sleep tracker and alarm, phone unlocking BlueTooth app eync etc. Price starting as low as INR 999. Their fitness tracking app ‘Mi Fit‘ is compatible with both Android and Iphone. Boltt Sports Technologies is a leading company in wearable technology and fitness trackers. They sell products such as fitness bands, connected shoes and stride sensors etc. Their fitness bands has got features like activity tracking, sleep tracking, social media and caller alerts etc. They are compatible with Ios and Android. Boltt verve Luxe and Boltt Beat HR are the popular products of Boltt starting from INR 1499. Yo+ H30 smart writbands are quite popular because of their touch screen display, Heart rate monitor, Distance and calorie monitor sensors etc. They are compatible with Ios and Android technology. Some popular brands of Yo+ are Yo+ H5 swimming Smart band and Yo+ P1(Best in class) Bluetooth smart band. They lie in the range of INR 2800 to 3000. The Timex brand of watches are quite popular all over the world. The company deals in making watches since more than 150 years. They have now forayed into fitness band category with the ‘Timex-Blink’ brand. It is available in different colors and is prized at around INR 5000. It has all the necessary features like step tracking, sleep tracking, notification alert etc. It can be synchronized with Android and Ios. This brand has got different products like car accessories, Bluetooth headphones and fitness bands. Their fitness bands have quality certifications like ROHS, CE etc. The band has got features like connected GPS, Multi-sports modes. Auto Heart rate etc. They have different products between the price range of INR 2000 to 2900 and more. Mobicell is a popular mobile brand which now also forayed into the fitness band market segment. It has the ‘Hi’ fitness band priced at an affordable ranges. It can track daily activities like the calories burned, distance traveled, smart alarm etc. It comes in different colours. Easypro fitness bands are found to be suitable for male or female across any age groups. EasyPro has different fitness bands offering different kind of features like Heart rate monitor, Calories counter, Sleep monitor etc. They all come in different prices from INR 1199 to 1999 and more. These fitness bands are compatible for Android 4.3 and above and iPhone 4S/5C/6P etc. 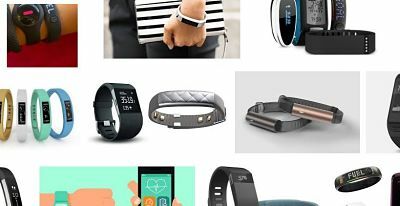 Fitbit Inc. is a famous American based company, known for its fitness products like activity trackers, wireless-enabled wearable technology devices. Fitbit bands measure data such as the number of steps walked, heart rate, quality of sleep, steps climbed, and other personal metrics involved in fitness. These band work nicely with Fitbit apps which is available for Android, ios & Windows. You can avail nice discounted deals for this band from these online stores. Established in 2002 Lifesence is a Netherlands based company & their products are available in India online. These bands work best with Lifesense Health Application for android&ios. Their top selling bands / smart watches are Lifesense Band 2, Lifesense Band 2S, Lifesense Watch etc. Hug Innovations is a Hyderabad based startup with 2 main products. One fitness band HUG Elan Advanced Multisport Fitness Tracker and another one is HUG HG01 Smart Watch. Hug Elan is world’s first IoT-enabled fitness tracker having the ability to learn from a user’s health and lifestyle habits and give personalised recommendations. And features intelligent sports detection to recognise the sport or activity the wearer is doing. Official website is www.huginnovations.com / Check price at Amazon. Subsidiary of IMG Technology Group, RIVERSONG is a Shenzhen(China) based company. Their major products include, smart band, earphones and WIFI audio accessories. They have set up branches in India, Dubai and also sell through different online channels. Ambrane is an Indian company selling different consumer electronic products like Head phones, Power banks, Speakers and mobile charging stations. This is another Indian, consumer electronics company based on Chennai. Products include Audio/Video, Computer peripherals, accessories, and Surveillance products. Their fitness products include Zeb Fit500(under 4000) and Zeb Fit100(under 1500 rupees). Huawei is a famous Chinese multinational company headquartered in Shenzhen. It is the largest telecommunications equipment manufacturer after overtaking Ericsson. Fitness band from Huawei is HUAWEI Band 2, Smartwatches include 6 different models named huawei fit, calling sports 4g, coaching sports bluetooth, multiple watch-faces classic gps, multiple watch-faces classic gps and huawei stainless steel smartwatch. Lenovo, being a Chinese multinational technology company is also selling fitness bands & smartwatches. GOQii is a California-based fitness technology venture founded by Indian entrepreneur. QOQii offers wearable fitness solutions paired with remote personalised coaching. Moov is a fitness experience innovation company, delivering motivating and effective fitness experience to make positive impacts on people’s lives. OMNiX is an Indian Chennai based company selling smart bands, smartwatches and other consumer electronic products. Drumstone is a fitness band which monitors your sleep activity, call and sms and record daily activities. It comes with a one year replacement warranty. It works with both Android and iphone devices. The popular series of bands in this category are Drumstone intelligence bands . These bands are available online and they come in different colours.